A News release in April 2015 by the World Health Organisation said that caesarean section is one of the most common surgeries in the world, with rates continuing to rise, particularly in high- and middle-income countries. Although it can save lives, caesarean section is often performed without medical need, putting women and their babies at-risk of short- and long-term health problems. Caesarean section may be necessary when vaginal delivery might pose a risk to the mother or baby – for example due to prolonged labour, foetal distress, or because the baby is presenting in an abnormal position. However, caesarean sections can cause significant complications, disability or death. Since 1985, the international healthcare community has considered the “ideal rate” for caesarean sections to be between 10% and 15%. New studies reveal that when caesarean section rates rise towards 10% across a population, the number of maternal and newborn deaths decreases. But when the rate goes above 10%, there is no evidence that mortality rates improve. In other words there is no benefit to mom or baby if the caesarean rates are above 10%. Within the private sector in South Africa, the caesar rate stands at over 70% with some gynaes caesar rates well into the 90%. 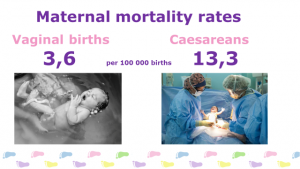 The following information is from http://www.childbirthconnection.org/giving-birth/c-section/research-evidence/ showing exactly what the researched evidence says about caesarean sections. Visit their website to view the actual research reviews. Is vaginal birth or caesarean safer? Vaginal birth is much safer than a caesar for most women and babies. But sometimes a caesar is the only safe option, like when the baby is positioned side-to-side in the uterus (transverse lie) or the placenta is covering the cervix (placenta previa). In other situations, having a caesar might possibly have benefits, which need to be weighed against possible harms. You have the right to know these possible harms and benefits, and only you can decide how important they are to you. When a caesarean is truly needed, its benefits likely outweigh possible downsides. However, without a clear medical reason for caesarean birth, vaginal birth is likely to be the far safer path for both you and your baby. This page summarises results of systematic reviews comparing outcomes of caesarean and vaginal birth. We look at shorter- and longer-term outcomes in women, caesarean-born babies and babies in future pregnancies that develop in a scarred uterus. 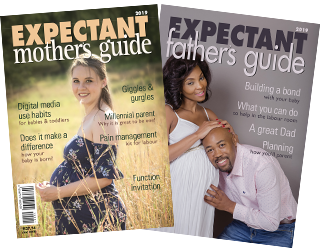 This page also reports on studies that point to problems that only occur with one or the other type of birth. What are the possible outcomes of caesars for women? Not establishing breastfeeding, which benefits both women and babies; this especially occurs when caesareans are scheduled before labour. Even though labour and vaginal birth can be hard work, they are generally easier on a woman’s body than a caesar. Recovery after vaginal birth is usually shorter and less painful than after a caesar, and allows the woman to spend more time with her baby. New research is discovering ways that labour and vaginal birth are good for babies, too. The hormones that cause labour to start and progress actually help the baby get ready to be born and reduce the chance of breathing difficulties and other problems. These hormones help prepare mother and baby for a safe transition at the time of birth, and help them feel close and connected and get breastfeeding off to a good start. What are the possible risks to my baby associated with caesareans? What are possible effects of a caesarean on my future pregnancies and births? Does caesarean protect against sexual, bowel and urinary problems?